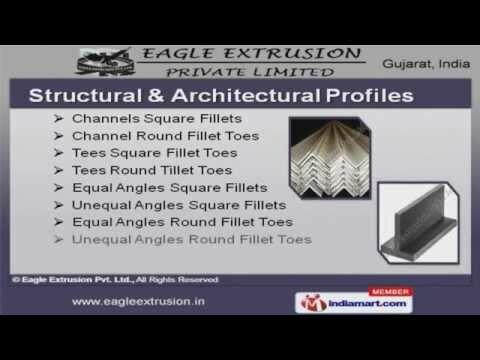 Welcome to Eagle Extrusion Pvt. Ltd. Manufacturer & Exporter of Hardware & Architectural Utilities We are an ISO certified company, established in 2002 at Surat. Our specialized R&D & quality conscious approach make us different from others. Industry leading price, customized solutions & diligent manpower help us to achieve an enviable position in the industry. We offer a huge gamut of Moulding, Tyre Recycling, Aluminium Extrusion Plant & Machineries. Our Bars, Rods & Tubes are in huge demand across the global markets. Structural & Architectural Profiles offered by us are extremely reliable. We offer Rectangular Tubes, Partition & Window Sections that are available at industry leading prices. Our Transport, Industrial &General Miscellaneous Profiles are a class apart. Along with that we provide Aluminium Extrusion Plant &Machineries that are widely appreciated in the market.